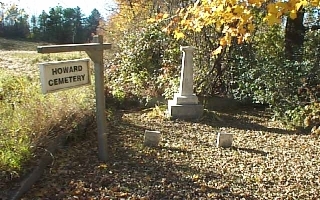 This cemetery is alongside Crosstown Road. A granite curbing runs around 3 sides of the lot. Inside the wall is a large monument and two small markers. There are only two names on the markers. Each of the markers have the given name of the mother and the daughter. It is an opinion that there are 3 persons buried there as there are three indentations in the ground. There is a tradition story written about this cemetery by J. Richard Nye that you will find very interesting. Story by J. Richard Nye.